A remake of a low-budget 1974 film, 2000’s Gone in 60 Seconds follows the misadventures of the Raines brothers, Randall “Memphis” (Nicolas Cage) and Kip (Giovanni Ribisi). Memphis is a reformed car thief, but younger brother Kip has become involved in the family business and has gotten himself into hot water. When this problem arises, Memphis volunteers to take on an apparently-impossible task to save his brother: they’ll steal 50 exotic cars in 72 hours. This leads Memphis to get his old gang back together and save Kip’s life. Although it offers a different storyline, Gone really seems structurally identical to flicks like 1998’s Armageddon. We get the set-up and then we meet the protagonist’s wacky crew of help. They’re always great at what they do, and they’re always quirky. It’s part of the formula used by producer Jerry Bruckheimer, and he didn’t see fit to abandon it for Gone. Another aspect of that tradition concerns the actors, as Bruckheimer hires top-notch talent, and Gone offers no exception to that rule. In addition to Cage and Ribisi, we find Oscar-winners like Angelina Jolie and Robert Duvall. Add solid professionals like Delroy Lindo and Will Patton and you find the usual terrific Bruckheimer cast. Absolutely nothing about Gone stands out from the formula. Circa 2000, director Dominic Sena was new to the Bruckheimer fold, but little about his style differentiates him from peers like Michael Bay or Simon West. We find the same slick visuals and rapid-fire editing that typifies these pictures. 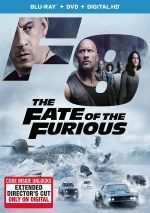 The movie cranks along at a hyperactive pace that leaves no room for any character development or subtlety, so it’s just a slam-bang rollercoaster ride. And you know what? That’s fine with me. Many grouse about the formulaic thrills of Bruckheimer movies, and I agree to a degree. The system became so deeply entrenched at this point that it was almost impossible for any of his films to become truly special. They’re usually entertaining – in their cliché way - but they never rise above that level to be noteworthy. Once you accept these limitations, however, you can at least be happy with the fact that you know you’ll get a decent effort from Bruckheimer. Is this trade-off acceptable? That’s for you to decide. While I know that a Bruckheimer movie won’t ever be a great action flick, I do like the fact that I can count on these works to usually be fun, frivolous material. Gone in 60 Seconds fits that mold perfectly. It’s a thrilling but brainless experience that you’ll enjoy while you watch it but then forget completely as soon as the credits end. Whether this is good or bad is up to you, but as far as I’m concerned, I accept it and have no great problems with it. The movie won’t take you to any heights, but it won’t disappoint you either, and there’s something to be said for that kind of consistency. Gone In 60 Seconds appears in an aspect ratio of approximately 2.35:1 on this Blu-ray Disc. A release from the format’s early days, the image seemed wholly lackluster. Sharpness became a problem, as the film failed to deliver consistent delineation. At best, the movie provided reasonably good definition, but much of the picture felt vaguely soft and tentative. Only minor signs of shimmering or jaggies appeared, and edge haloes failed to become an issue. Print flaws stayed modest, as I noticed a couple of small specks but nothing more. As expected, Gone opted for heavily stylized colors, as the palette primarily mixed heavy yellows, blues and greens. These tended to come across as somewhat heavy, so they lacked the vividness I’d anticipate. Blacks were a bit mushy, while shadows tended to appear a little on the dense side. This wasn’t a bad image despite its drawbacks, but it came with too many issues to merit a grade above a “C”. I felt more pleased with the Uncompressed 5.1 soundtrack of Gone in 60 Seconds, as this sucker kicked into higher gear during the opening credits and rarely let up after that time. All five channels offered a tremendous amount of discrete information throughout the film. The audio placed all sounds correctly in the proper locations and blended them together neatly. When cars moved across speakers, I heard no awkwardness or forced qualities, so the vehicles panned smoothly and effectively. The track provided consistently engaging and involving sound at all times, but it really took off during the film’s climactic car chase. That’s when it delivered everything I’d want from it and turned into a killer mix. Audio quality seemed similarly strong, as dialogue appeared crisp and distinct with no signs of edginess or problems related to intelligibility. Music felt dynamic and bold and seemed accurately reproduced, so the songs and score all were clear and bright. Effects appeared realistic - sometimes hyperrealistic, really - and lacked distortion or other flaws. Bass was deep and taut and added a solid punch to the package. Ultimately, the soundtrack to Gone offered exactly the kind of stellar experience I expected from it. How did the Blu-ray compare to the original release? The lossless audio showed a bit more punch and power, whereas visuals felt tighter and smoother – to a degree. I suspect the Blu-ray came from the same transfer used for the old DVD but the format’s capabilities allowed it to fare better. Note that a Director’s Cut DVD also exists. That version fails to appear here, so we get only the theatrical edition. The Blu-ray drops all of the DVD’s extras except for one featurette. The Big Jump lasts three minutes, 12 seconds and includes comments from director Dominic Sena, stunt coordinator Chuck Picerni Jr., and producer Jerry Bruckheimer. “Jump” examines one of the movie’s big stunt scenes. It’s way too short to tell us much, but it creates a decent little overview. A staple of early Disney Blu-rays, Movie Showcase delivers a form of chapter search. It lets you jump to any of three different action scenes. It’s a waste of time. 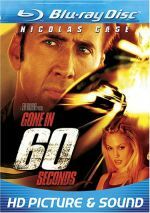 No one will award Gone In 60 Seconds any prizes for originality, but it nonetheless provides a solidly entertaining and exciting experience. Predictable as it may be, it still gives us a fun ride. The Blu-ray offers excellent audio but picture seems mushy and inconsistent while the package lacks many bonus features. While this remains a lively film, the Blu-ray disappoints.